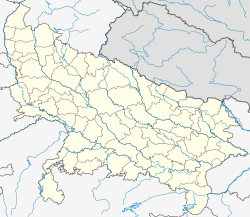 Uttar Pradesh (Hindi: उत्तर प्रदेश, Urdu: اتر پردیش‎‎) is a state in northern India. For short, people call it UP. Lucknow is the capital city of UP. The population of the state is 199,581,477 (census 2011). It covers an area of 93,933 mi² (243,286 km²). It is bigger than the United Kingdom but smaller than Guinea. In traditional Indian geography it falls under the North Indian zone. The larger Gangetic Plain in the north: it includes the Ganga-Yamuna Doab; the Ghaghra plains; the Ganga plains and the Terai. It has highly fertile soils and flat topography. There are also many ponds, lakes and rivers. The smaller Vindhya Range and plateau region in the south. There are hills, plains, valleys and plateau. It is harder to get water. The climate of Uttar Pradesh is mostly subtropical. However weather conditions change a lot depending on where one lives and the season. Temperature: The average temperatures vary from 12.5–17.5°C (54.5–63.5°F) in January to 27.5–32.5°C (81.5–90.5°F) in May and June. The highest temperature recorded in the State was 49.9°C (121.8°F). It was at Gonda on May 8, 1958. Rainfall: Rainfall is between 1,000 and 2,000 mm (40–80 inches) in the east and between 600 and 1,000 mm (24–40 inches) in the west. Most of the rain is due to the southwest monsoon. It lasts from June to September. Consequently, floods are a problem during those seasons. They badly damage crops and property. Droughts: They occur when the monsoon does not come in the usual season. It leads to crop failure. Snowfall: In the Himalayan region of the State it usually snows from 3 to 5 metres (10 to15 feet) between December and March. Airways: The state has four important airports and 23 air strips. They are in Agra, Kanpur, Lucknow and Varanasi. Lucknow is the biggest and most important airport of the state. Railways: Almost all the major cities and even some smaller cities are linked. The state has the largest railway network in the country. Its total length is 8,546 km (2006). It has the sixth largest railway density. Roadways: The state has the largest road network in the country. The biggest is Maharashtra. There are 31 National Highways (NH). In total they are of 4,942 km (8.5% of total NH length in India). It has the seventh highest road density in the India (1,027 km per 1000 km2 in 2002). It also has the largest surfaced urban road network in the country (50,721 km, as on 2002). Cities of Kanpur, Lucknow, Bareilly, Allahabad, Varanasi, Jhansi, Gorakhpur, Noida, Ghaziabad, Meerut, Mathura, Agra and Ghazipur are connected to many National Highways. Waterways: The river Ganges - from Allahabad (Uttar Pradesh) to Haldia (West Bengal) - has been declared as National Waterway (NW)-I and 600 km of the total NW-I lies in Uttar Pradesh. This page was last changed on 3 November 2018, at 13:05.